You can also purchase as low as $495. 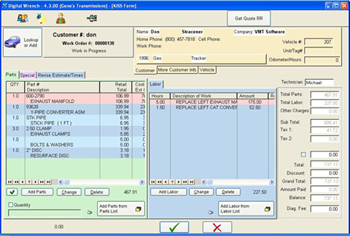 Repair Order Software for your type of business, Auto, Diesel, Marine, Motorcycle, many more. As low as $34.95mo, or purchase $495.00. Track RO's, Inventory, labor hours, history, reminders, scheduling. EZ to train new personnel. Fleet maintenance, transaction tracking. Optional Point of Sale, Marketing modules. Built in Email and text messaging. Import CSV files into inventory. Many more features than we can list here, yet, at the same time, very easy to use. Great Tech support. Digital Wrench Reviews Recently Reviewed! Pros: The inventory tracking is my favorite part of the software. it is easy to use and easy to track quantities of parts used throughout the year. Cons: I have noticed that when I save and print repair orders that it cuts off some of the sentences or does not print everything I wrote. Everything is there when you view the repair order but not after you save it to pdf. I also save all my forms to pdf so I can put them into an equipment records folder to keep track of each piece of equipment for the year and print them off. I have not found a way to send it directly to the folder. I am having to save it and then transfer it from my wrench folder in the C:/ drive to individual folders. Like I stated before, we do not include taxes or labor rates in our repair orders. It would be nice to have the option to remove different fields from the repair order to clean it up. Overall: I purchased the program for the University of Alabama Grounds Department. This program is geared towards an individual shop owner, which is not exactly what I needed, but this is the closest program I could find to what I needed. We don't actually have customers or charge for parts or labor, we just needed a program to track what repairs we did to equipment within our department and how much money we spent on parts for each unit. I purchased the program mainly for the inventory portion to track how much we use throughout the fiscal year. We got several quotes for other repair utilities suited for our needs, but most were upward of $10,000 or more. All in all, I am very pleased with your program and it has helped us tremendously in keeping repair records of our equipment. Recommendations to other buyers: I am very please with our program and our customer support we had while using the demo and setting up the account! As far as the RO printout is concerned we can fix that in short order. If you have the newest version, the invoice printouts have been fixed to show all of the labor. Also, some invoices now won't show the tax fields if you don't have taxes. Either way, you can use and/or copy one of the custom invoices and modify it easily and we'll be happy to help. To automatically send the pdf's to a particular folder you can set that up in the company setup area. Pros: I like the ability to give my customers a detailed description of repairs performed and individual price of parts on one receipt. Cons: It is rather difficult to find previous repairs for 1 customer. Overall: I started my own auto repair shop a year and a half ago. Was looking for a software to keep track of all repairs and inventory. Was refered to Digital Wrench who was using software for an ATV shop. Looked into it and tried demo and fell in love with it. Ordered full version right away. Other than the ease of use, The price was the best part of this software. Recommendations to other buyers: If your looking for software to manage just about every aspect of your business, It is well worth it to invest in Digital Wrench. To find all RO's for one customer click on the $ icon from the main screen, click on Find Customer, select the customer. Unclick balances only to see all past Ro's. You can then filter them by date, vehicle, or search by a keyword to see all Ro's that have that word. Call and we'll walk you through it. For basic software for a smaller business, it's great for our needs. Pros: For the most part, this software is very user friendly. We can easily access most information we need through search tools. Invoicing and keeping track of sales is very easy. Cons: A customer email function would be nice. We don't mass email often, but when we do, we have to copy/paste emails into our email account. Also, finding vehicle information is easy for every aspect of the vehicle except the VIN. Overall: Easily contain all customer information, easily access information of accounts, and invoicing. Glad to hear it's working for you. As far as Email is concerned, you can use our Letter Editor (an optional program) to mass email your customers. This is nice because you can also do a 'Email Merge' so the letters are custom to each customer. You can also send a text or email to your customer to let them know the vehicle is finished. And of course you can email the customer the invoice or estimate as a PDF along with a custom message. Pros: I've been using VMT Digital Wrench for 3 years now & the value you receive in this product is far beyond the price tag associated. In the Marine Industry the Work Order & POS Systems come at a premium rate but Digital Wrench does everything they do with the same ease of use they come with. For anyone looking for a professional product at a unbeatable value, VMT is by far the best option!! Pros: Ease of use once you lean the curve ,which is no to hard. Cons: Not being able to pull up a single car past history or maybe i do not know how. In order to see a complete history for a customers car, click on the $ icon on the main screen, click on the find customer button. Then, click OFF the balances only checkmark and you will see all RO's, estimates, WIP's and Completed RO's (Invoices). To see just one vehicle, Click on the Vehicle Icon, select the vehicle, then click on the checkbox to the left of the vehicle. Not hard once you do it once. Pros: THE MARK UP PRICE/ THE PACKAGE FOR OURS MOST IMPORTANT JOBS/THE MULTIPLE CATEGORIES FOR ALL WE NEED. Cons: THE TAG # AND THE MILLAGE THAT WE ENTER IN THE VEHICLE PRIMARY PAGE DOES NOT PASS TO THE INVOICE PAGE. WE NEED TO PUT AGAIN. Overall: THIS PROGRAM GIVE US A CONSTANT PERFORMANCE TO OUR SHOP, GREAT FOR OURS CLIENTS, SOME SAID NEVER SEE BEFORE A ENVOICE SO CLEAR AND FRENDLY. You can turn on syncing for the mileage and tag# in the company setup area. Let us know if you still have a problem after that. Pros: HOW EASY CAN THIS GET? THE LEARNING CURVE IS JUST TO EASY. I HAVE TRIED OTHERS AND THIS IS BY FAR THE EASIEST. THE INVENTORY MODULE IS GREAT. YOU CAN SEARCH ANYWAY YOU WANT. THE PURCHASE ORDER MODULE IS AS EASY AS DRAG AND DROP AND THE EMAIL OPTION MAKES IT SUPERB. THE END OF DAY CASH DRAWER OPTIONS ARE SUPER. ADDING NEW CUSTOMERS IS A BREEZE. AND OF COURSE THE FLEXIBILITY OF THE SOFTWARE AS A WHOLE IS JUST AWESOME. THE GUYS, DON AND RAY, AT DIGITAL WRENCH ARE ALWAYS LISTENING TO THEIR CUSTOMERS AND IMPROVING THEIR PRODUCT. GREAT VALUE, YOU GET A LOT FOR YOU MONEY. Cons: WELL WHAT CAN I SAY I LIKE THE SOFTWARE. I WOULD LIKE MORE COLOR DOTS AND NEW AND IMPROVED TRAINING VIDEOS . Overall: MAKES THE COMPANY LOOK GOOD, WHEN WE CAN PULL UP A CUSTOMER IN SECONDS. Pros: YOU CAN CUSTOMIZE TO YOUR NEEDS. PRICE IS FAR BETTER THAN ANY OTHER PROGRAMS I'VE LOOKED INTO. LIKE SNAP ON,NAPA,MITCHELL. Cons: DON'T REALLY HAVE ANY. WOULD LIKE TO CUSTOMIZE A LITTLE MORE TO MY LIKING & PROBALY COULD IF I WAS MORE OF A COMPUTER WIZ. I KNOW JUST ENOUGH TO GET MYSELF INTO A JAM & THEN HAVE TO ASK MY SON FOR HELP. Overall: HAVE BEEN USING PROGRAM FOR A LITTLE OVER 3YRS,HAD A FEW PROBLEMS IN THE BEGINNING BUT TECH SUPPORT WAS ONLY A PHONE CALL AWAY AND ALWAYS VERY HELPFUL.PROBLEMS WERE ALWAYS RESOLVED QUICKLY. Pros: The price, by far the best out there, very affordable! The customer service is awesome!!! You can call Ray or Don anytime and they are quick to answer, really listen to your concerns (even recommendations! ), and they are extremely helpful. Very nice guys too! Cons: I can not think of one complaint! Overall: Starting our new business and trying to find the right software for our repair orders was overwhelming. Until I came across Digital Wrench. I watched a youtube video, read reviews, and gave it a try. Best decision ever! Recommendations to other buyers: Watch the videos they have uploaded, they are helpful. Keep up with the system updates. Pros: The simplicity and the customer support. Cons: Honestly, there are a couple of very minor things that I need to understand, but are probably easily cleared up with a call to customer support. Otherwise, I'm completely satisfied with this program. Overall: I'm a small, (two man) busy Auto repair shop owner who is not particularly computer savvy. This program is perfect for someone like me due to it's simplicity, and ease of use. The customer support is second to none. For my business, I don't use many of the functions available to me, but it's nice to know that they're there when I need them. Pros: I find it hard to use. And there is really nothing for me to coment on. The Program works great but is not what I was expecting. Cons: As many of the other Software's out there this is aiming for the "Selling" and "Money" side of things. It is certainly not catering to the Customer. When I purchased this I was hoping to get a Software that can easily show me repairs that I did for my customers but that is not the Case here. I am disappointed that the Customer gets left out in the cold. So if you are looking to serve your Customers you may want to look elsewhere. If you worried about the Money side of things this Software is more than capable to do that for you. Overall: It is flawless in keeping record of my cashflow. Sorry to hear you're having trouble finding the customer history. All RO's relate to a customer, so you can easily see all work done, all parts sold to any particular customer by clicking on the $ icon on the very first screen. Then, click on the Find Customer button, select the customer and all RO's with balances will immediately display. To see all RO's, just uncheck the Balances Only button. You can also filter the repairs by one of the customer's vehicles, a date range, or even search parts or labor with a keyword like 'Oil' or 'Brakes' or whatever you choose, all from the same screen. If you every have any difficulties, please let us know. We are happy to help. Plus, it is comments from our customers that enable us to keep enhancing and improving our software. Pros: customer and unit number tracking and parts inventory and reorder ability. Cons: cores and core tax issues. Overall: I will start out with the bad first. As a small independent repair shop this software is nearly perfect. The only flaw it has for us is the fact that we cant track cores or do core tax that Oklahoma charges but we don't get back. however it is great for tracking inventory, techs time on jobs and is excellent for customer and unit number tracking for previous repairs. Overall I would buy this software over and over and over if needed. P.S. Jim was excellent at writing a specific repair order format just for our company. Recommendations to other buyers: it truly is great for independent repair shops. Thanks for your review Scott. I will make sure the core charge issue is put on our ToDo List. Pros: Tech support is the best. Always a fast response. Overall: Great software and the customer service is awesome. These guys are very professional and helpful. Glad I found this product. Better than all the others out there by far! Recommendations to other buyers: It's awesome. If it can't do it, just call them and they will try to accommodate. Overall: could use easier simple reports and easier flat rate hour tracking. iCONS COULD BE MORE SIMPLE AND MENUS AS WELL. Pros: It took me a little while to get used to using the software but CSR were there to get me on my way. Cons: There really isn't anything I can say negative about Digital Wrench. Overall: Digital wrench allows me to easily make work orders and invoices. The customer support is beyond good. Pros: Lots of features and really simple to use, great customer service. Overall: I love this software, it does everything we need and more. As a fairly young shop we are still finding new features and learning how to use them. Any time we have a question, the never hesitate to help us out and walk us through any new feature or problem we may be having. Pros: Super easy to run. No learning curve, installed and started using. Cons: Cannot use with my Realtime Labor guide online subscription. Overall: I run a one man one bay shop. I needed something affordable and useful. I say useful because some of the more expensive management packages have way more features/options than I need. We have talked with Real Time Labor guide last month. They have a CD version that we are compatible with. They do not have an interface for their on line system yet. BEST VALUE SERVICE SOFTWARE HANDS DOWN! Pros: EASE OF USE, VERY AFFORDABLE. Overall: I WAS DOING PARTS AND SERVICE ORDERS BY HAND FOR YEARS. AFTER GETTING DIGITAL WRENCH, I AM ABLE TO SHAVE HOURS OFF OF MY DAY AND KEEP RECORDS AT A BUTTONS REACH. THE TECH SUPPORT IS SECOND TO NONE! Recommendations to other buyers: PERFECT FOR SMALL BUSINESS AND DEALERS ALIKE! Pros: We have enjoyed being able to store customer information. It is a time saver once a customer's information has been imputed. Cons: There are a lot of steps to remember, so you need to use the program frequently to get familiar with it. Overall: Digital wrench has been been a great tool for our automotive program. We are able to show students how to write repair orders on a computer and maintain a customer database at the same time. Al, If you view a closed RO you can click on the customer edit icon at the top and edit the customer and it will copy the customer info into the closed RO. Call if you need help with that or it is something else. Simplicity with a great backbone. Pros: Ease of use, customer tracking, and parts list. Cons: Not completely necessary, but would be nice to have a sales tax report integrated(maybe it does and I havent found it). Overall: I was looking for a program that was easy to use with a lot of features. I found digital wrench to be just that. There are a lot of features that I still dont take advantage of. Overall: I have had this software for over a year now and have had no complaints at all. It has made my job a lot easier. Plan to keep from now on. Pros: Keeps track of my most common sales and repairs. Cons: Reports took me a while to understand but once I did it a few times the better I liked it. Overall: This program is so easy to use and it saves me time. Customer service is the best. Do your self and your business a favor and get this program! Well worth the $$$! Its a great shop siftware! Pros: It's easy to use & keeps track of everything I need so far. So far so good. Cons: Not at this moment. Overall: This software is great & Don is very helpful and knowledgable. Tried other softwares in the past. Either it's too expensive or it doesn't work as it should. Recommendations to other buyers: Not at this moment. Digital Wrench, ANOTHER TOOL FOR SHOP SUCCESS! Pros: NO CONTRACT. EASY TO USE. HAS ALOT OF FEATURES IN THE PROGRAM. LOOKS PROFESSIONAL. Cons: DON'T REALLY HAVE ANY. Overall: I HAVE A SMALL SHOP. HAVE HAD THE BIG NAME COMPANIES SOFTWARE. BUT THE BIG MONTHY FEES WERE A BIG BURDEN. DIGITAL WRENCH HAS A SMALL MONTHLY FEE WITH NO CONTRACT. START WHEN YOU WANT, END WHEN YOU WANT. IT HAS ALOT OF FEATURES AND DOES MORE THAN ENOUGH. IT HAS WORKED WELL FOR MY SHOP. THIS PROGRAM ACTUALLY ALLOWS ME TO BE MORE PROFITABLE. I JUST PUT THE PARTS AND LABOR IN, IT DOES ALL THE FIGURING. WHAT THE BOTTOM LINE IS, THAT'S THE REPAIR COST. Recommendations to other buyers: IT'S GOT A FREE TRIAL. I USED IT FOR ABOUT 3 MONTHS BEFORE I HAD TO DECIDE ON WHETHER TO PURCHASE OR NOT. TRY IT OUT! Forier Transform Botswana Pty Ltd use Digital Wrench Auto Workshop management software daily. Pros: Easy navigation with well placed dashboard and comprehensive report formats. Cons: Difficulty to link it with electronic catalogues. Overall: The software is affordable and easy to use. The software organized our daily operations in amazing way, we are now able to keep track of our spares inventory and track work in progress. Overall it made us look more professional on services we offer. Recommendations to other buyers: The software should come with basic common spares and work procedures pre loaded, just like the demo version, it will save us great time to system categories and spares. Pros: Easy to use. Tracks my invoices and sales data. Cons: It is overkill for what I do need but I guess it is not really a con. Overall: When I was looking for an invoicing software this was not the first to come up on google search. After trying a few unsuccessful other soft wares I came across Digital Wrench. Right from the start it appeared to do what I needed it to. Customer service was on the ball. The other ones I tried did not even respond. Have been using now several months and no issues. Recommendations to other buyers: Excellent all around software. Comments: We have used VMT's Didital Wrench for more then 12 years. I work at a Golf and Country Club. We have 208 golf carts and alot of turf equipment. This program lets track it all. I have about $250,000 in parts and it is nice to go to one place to find it. It is a ez program to set up and use. One new thing they came out with is the daily reminder to back up everything. We do about 5 invoices daily. When I have had a problem Don always helps me fix it. So great coustomer service. The only con is that when one of the members leaves we can not del. there costumer number. Tim, In the new version you can transfer all Ro's along with the vehicle to a new customer, then delete the old customer. Pros: It is simple enough and somewhat comprehensive. Cons: You can not open invoices in a lot of reports(example ; Brows invoices). The inventory report does not give the total amount for each vender. The history on inventory items needs improvement. Overall: Overall the software is sufficient for my needs, however the report part is not complete and should be improved. Andy, Give us a call and we'll go over your idea's and see if we can get them resolved. Comments: Pros: We have been using this for about 3 year now and we love it. I recommend it to anyone who has a repair shop. All of the updates are free and the customer service is the best. Any time I call Don for tech support he always has time for us. Getting updates, how to access certain features on the software and any questions we may have. Thank you Don. Cons: When you first get the software I didn't have any instruction on how to use, but calling tech support was really helpful. Thank you Jesus. Just so you know, we have the help files that can also be printed if you need a hard copy. Also, there are several videos online that can be a great help for beginners. Pros: I really like that is really easy to keep track of our inventory on the inventory module.Really easy to use. Cons: I would like them to add more trainning videos. The ones there help make the most out of the software. Comments: Looked long and hard to replace our old system and found Digital wrench and it has been working great we have 3 work stations and they all work great together, way more efficient now that we changed up to Digital Wrench. Ray and Don have always been there when needing a question asked support is great. Considerably better than Quick books. Pros: Inventory quantity and ease of use. Overall: I spent $500 on Quickbooks Premier and was completely dissatisfied with it. It was only capable of holding 14,500 lines of inventory as well as being very difficult to use. I have been using Digital Wrench for almost a year now with no problems. Customer Service has been outstanding with helping me use the software. I currently have over 300,000 line items of inventory and the program has not slowed downed at all. Great program! Easy to use and find what you need. Great support team, highly reccomended!! Comments: Great program! Easy to use and find what you need. Great support team, highly reccomended!! I have already told the other companies in the area about and they said they were going to gove it a try. Pros: If you like to know where the money is ? Cons: Everything is about Money and not the customer! Overall: Could not make them understand my Overall Customer focus. Comments: The software is at a great price point, the purchased version does not expire (like our past program). Support has been extremely prompt and efficient along with well engineered updates. The customer support is refreshing, whereas a live person is happy to help, even small businesses like ours. I would recommend the free trial to see a great functional snapshot of the product. Couldn't operate without this program! Comments: We started using Digital Wrench in our motorcycle shop about 3 years ago. We couldn't imagine how much it was going to help us with day to day operations. The customer service is always very helpfull and understands that we repair motor vehicles, not computers! Digital Wrench has saved me a lot of time on POS. Comments: To start with I have no cons, this program does everything I need it to do. to make it work for you. I am very Happy. Comments: Very easy to setup. Very easy to learn, very easy to enter information support is a click or a phone call away answered all the questions right away. Comments: I CAN ONLY SAY GOOD THINGS ABOUT IT. IM NOT THAT COMPUTER SAVVY SO THIS PROGRAM IS VERY EASY TO UNDERSTAND. I WOULD RECCOMEND TO ANY ONE LOOKING FOR AUTO REPAIR SOFTWARE. Love it! Finally an interactive shop software with options and features! Great customer support! Comments: Very solid database, easy to navigate, endless options and features, can be used for simple or complex tasks, great customer support, excellent price. Comments: Ray has been great in helping me set up the software. The program is very stable with no glitches. Ray also does update on a regular bases. Comments: Easy to use, great support, made filing my sales tax reports a breeze. very happy with the program as a whole. Cons: Not vin. driven. No auto complete. Overall: I have been using this software since the beginning of June and have found that the below listed cons if fixed would help immensely!